I know, I know, I know. Adobo again? I guess we can't help it! 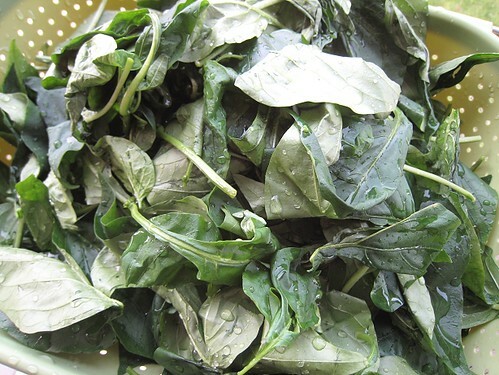 Another classic adobo dish, besides chicken and pork, is adobo kangkong. 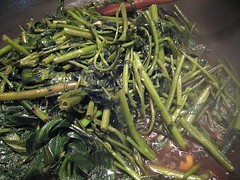 I must say, I really love adobo kangkong. 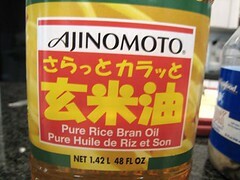 Actually, it's one of our mother's favorites too. 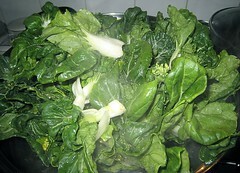 She's on an adobo kangkong spree: we've had adobo kangkong about four times in 2 weeks now! It's that good. 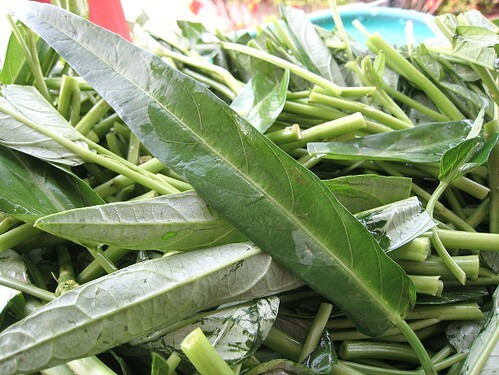 Kangkong is water spinach. 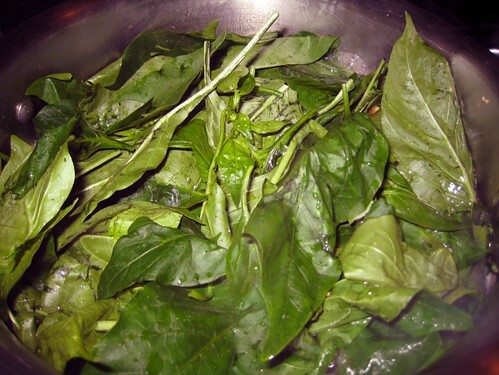 In the Philippines, we used to joke that kangkong just grew in the "canal" -- ie, in the sewer! 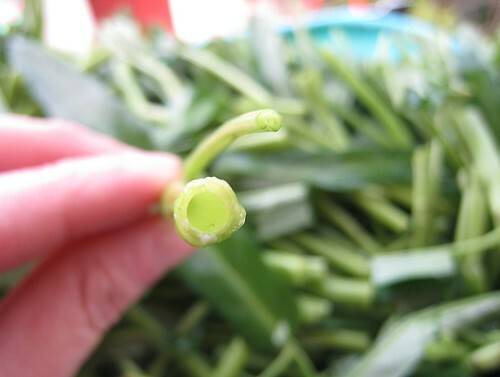 The stalks are hollow (so cool) and the leaves are long and slender. 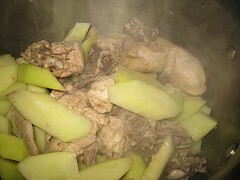 In classic adobo manner (seen here and here), in the pan goes garlic, then everything else: kangkong, soy sauce, vinegar, and black peppercorns. 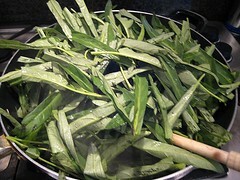 Cook until the kangkong is the desired doneness. Sometimes I think my favorite part are the leaves. But then, other times I think I like the stalks best. I'm so confused. 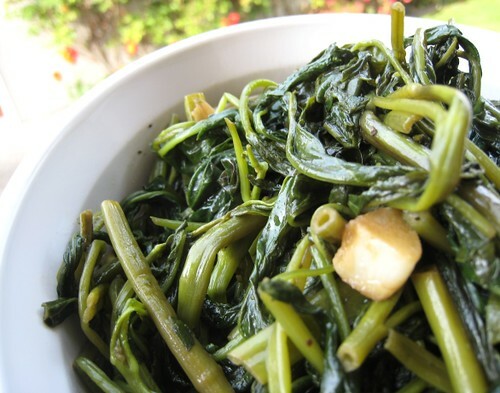 I guess I just love kangkong unconditionally. 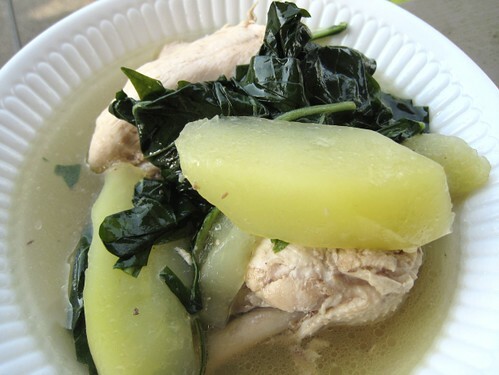 Chicken tinola is one of my all-time favourite dishes. 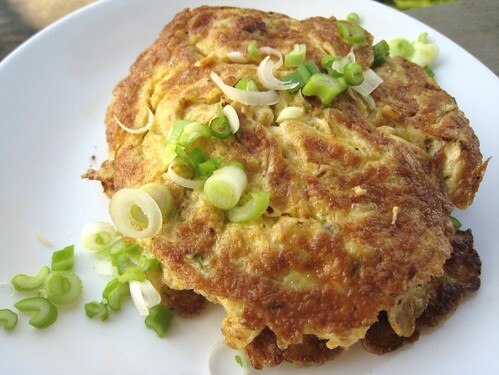 It is one of the dishes that I remember asking our Yaya to make me every once so often during childhood. 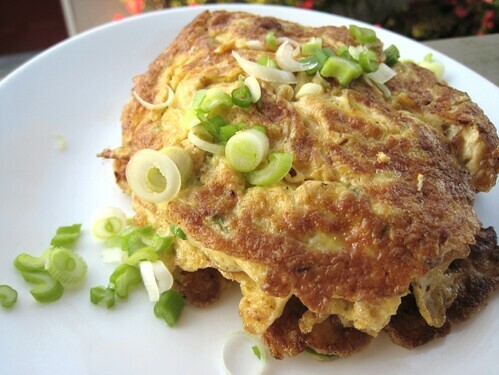 It is an extremely simple dish to make. In true minimalist fashion, there are only five ingredients I need to make chicken tinola: chicken, green papaya, chili pepper leaves, ginger, and fish sauce. Sometimes we can even get away with having no green papaya. 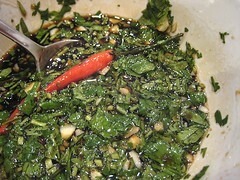 The ingredient that makes chicken tinola a chicken tinola is the chili pepper leaves (dahon ng sili). 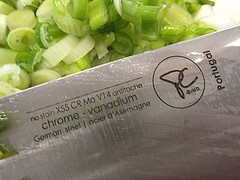 The picture below has garlic together with the ginger. I usually like just ginger, lots and lots of ginger. I can dispense with the garlic. 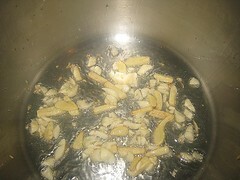 Sauté the ginger pieces in a little bit of oil until fragrant. Put the chicken pieces in and sauté. 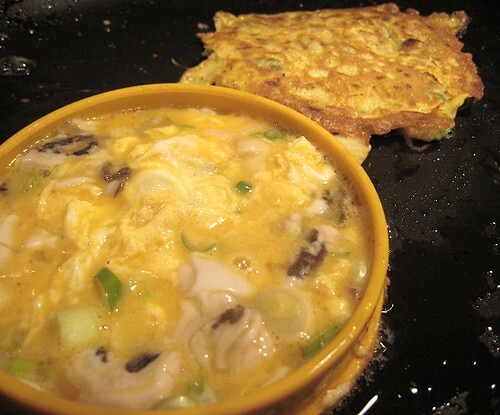 Browning the chicken pieces adds a lot of flavour, but can be skipped if pressed for time or lacking industry. Here, we just cut up a whole chicken into smaller parts. 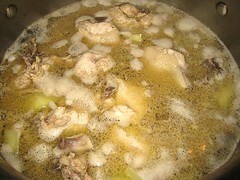 I must say that my favourite has to be chicken tinola made with chicken wings though. 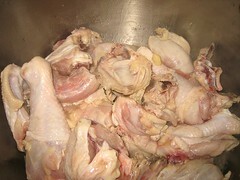 I find myself not caring much for the meat and prefer picking out the meat from between the bones of the wing. It's that part that makes the whole chicken tinola experience for me. 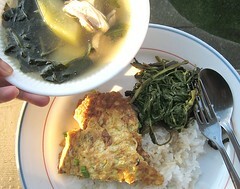 Chicken wing tinola makes for a much more flavourful result, probably because of the fat content in chicken wings. Add the green papaya pieces, add water, and then season the broth with a little bit of fish sauce and the whole dish is one step close to being done. Add the chili pepper leaves at the end. 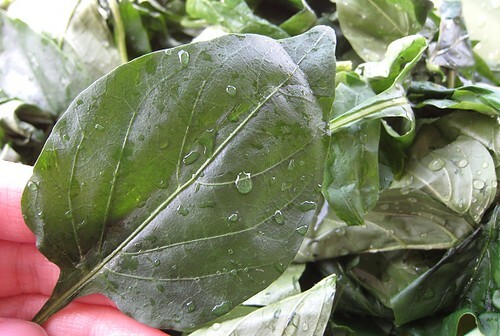 The chili pepper leaves have that distinct greengrassyherby aroma that is the smell of tinola. I'm sure some people would say substitute with spinach or water spinach but it's really not the same. 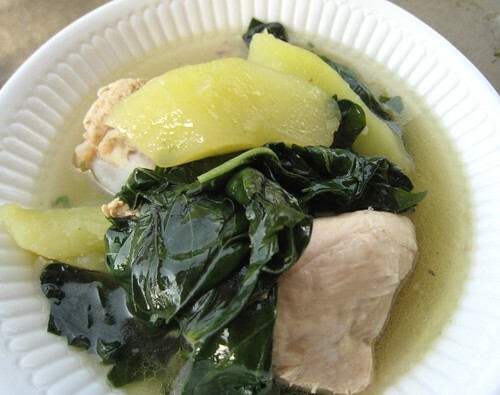 Without the chili pepper leaves, it's not chicken tinola, merely another chicken soup. 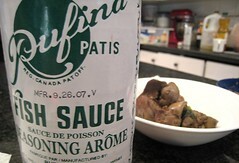 I made a little condiment for the chicken tinola, following this tip from Connie at pinoycook. 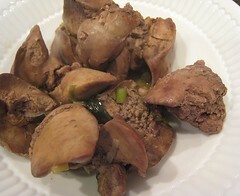 I boiled chicken livers in a separate pot in some tinola broth until done. 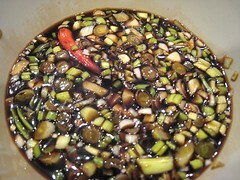 Then I took the pieces and mashed it with patis (fish sauce). 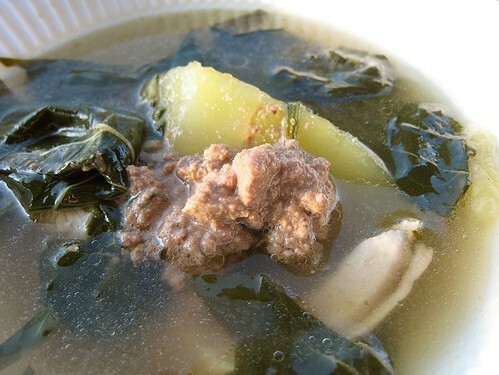 Quite tasty and perfect not only with the tinola, but on its own with rice. We stopped by at Suvai because we wanted lunch nearby. I was looking at the menus posted outside and saw they had a Spring Lunch 2008 menu, so that clinched the deal. Only the brunch menu was available! 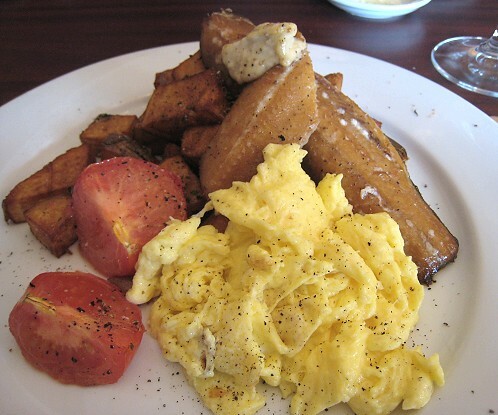 I don't really like "brunch" all that much... nor "breakfast" in restaurants, for that matter. I chose more "lunch" type items. 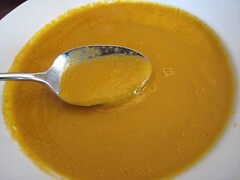 I ordered a soup because it was a pumpkin (or squash) and PEAR soup. The soup was very nice, but I didn't really taste the pear. Oh well. 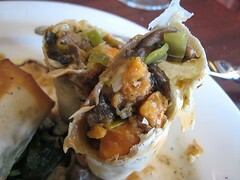 Next was a mushroom, leek, squash strudel. I forget the sauces on the plate. Tasty. Overall, the execution was good and the dish worked. 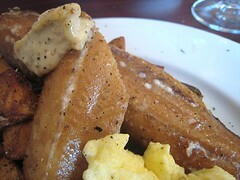 I had the smoked herring and scrambled eggs. 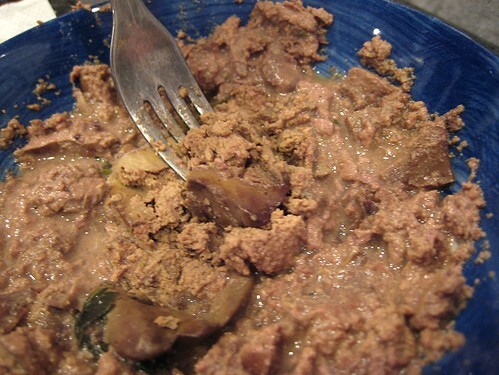 It was a well-executed dish. I quite enjoyed the dish, although I don't think it's a dish I'll ever order again. Strange, eh? It's probably just a dish that's not for me. 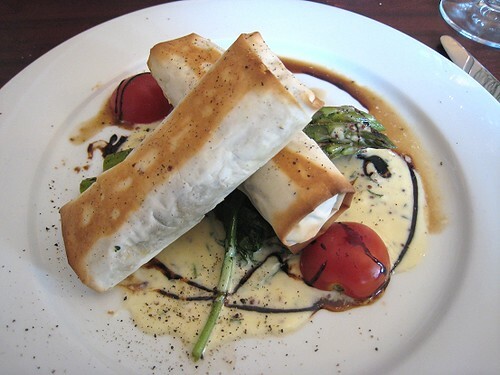 Supposedly there was a mix-up with my order; that is, the wrong item was entered so I had to wait a bit for my strudel. Hence, the complimentary dessert. This was really good. And look at that nice crackly sugar top! The creme brulee was very good. 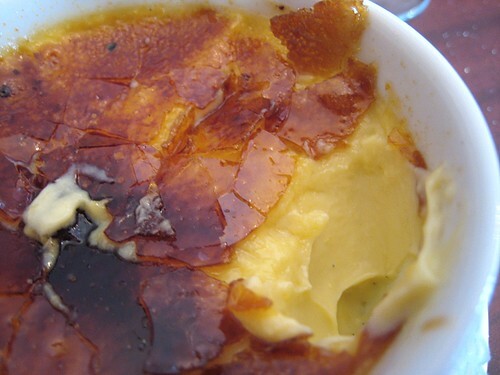 I don't usually crave creme brulee, but this one made me happy I had one. This one was one of the better versions I've had in a while. This is good decent fare. 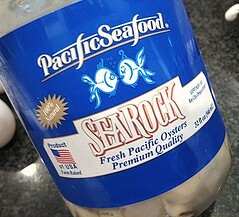 We'll try it again for "real" lunch or dinner. 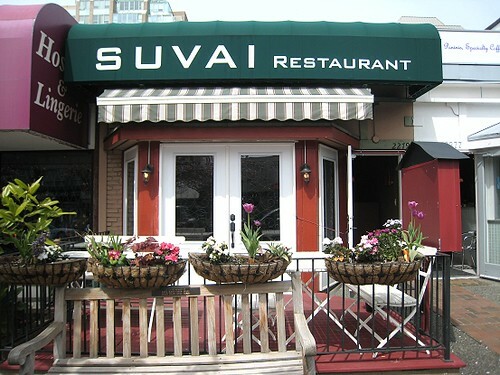 Suvai is a good restaurant, one that I wouldn't be averse to visiting on a regular basis. It's chef-owner-operated, and the dishes that we ordered shows that the chef cares about the food and works hard on giving the diner good value for the money. It's honest, proper food, executed well. I hope the restaurant stays for a long time and the neighbourhood supports the chef. Sometimes, it frustrates me to see people flocking to chain restaurants with crappy food and not valuing real, honest-to-goodness, proper food, lovingly slaved over by people who actually care about giving the diner good food instead of just making money. Oh well, that's another rant for another day. Finally, there are more and more choices of restaurants near where we live! Of course, that still won't stop our general indecision and seemingly great difficulty when deciding where to eat. Since CSC (our guest baking blogger) is enamored with anything America's Test Kitchen (ATK), she was more than willing to try out new recipes. JS requested these lemon bars because we can't seem to get ourselves to make a lemon tart. Here's the recipe in a nutshell. Step 1: Preheat oven and prepare pan. Step 2 & 3: Make the crust and bake. Step 4 : Make curd. 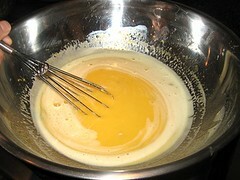 Whisk eggs/egg yolks with sugar, lemon juice & zest and butter. Step 5: Strain curd, stir in cream. Pour onto warm crust and bake. The recipe makes a note that "[it] is important to pour the warm filling over a warm crust when making these intensely flavored bars. 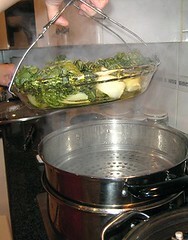 This ensures that the filling cooks through evenly." The first time I made these bars, I didn’t really read through the procedure. I figured I could just do them as I read along (which worked fine for the carrot cake, cupcakes and banana breads that I’ve done previously). So, it was MAD PANIC when I got to Step 4! I didn’t realize I had to zest and juice 4 lemons while the crust was baking, and do a whole bunch of stuff. Hard to do when your kids are around wanting to “try” and zest and juice and whisk. 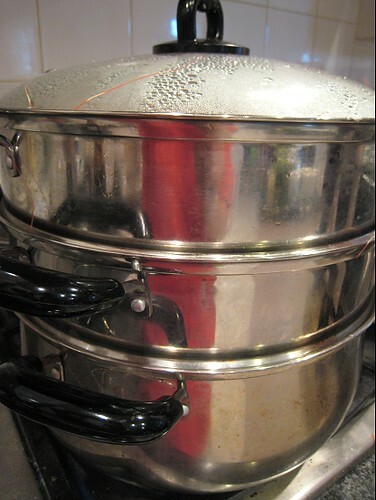 Good thing I found all the bowls I need and the strainers when I needed them. The second time I made this, I made sure I had the juice and zest all ready, and the kids were playing outside, so the second time was no-more-panic-Step 4. 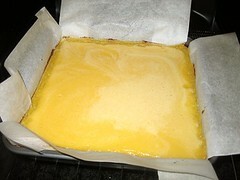 JS liked the lemon bars chilled/refrigerated. ATK does not mention anything about refrigerating them, so I don’t know at what temperature the “real, kitchen-tested” lemon bars are supposed to be served. The first batch of lemon bars weren't refrigerated. For the second batch, I insisted that they be refrigerated. That way, the curd would set nicely and be easier to cut. 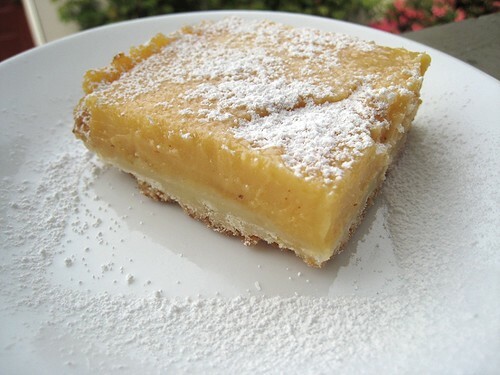 I have a weakness for lemon bars. In fact, I have forbidden CSC, as of this writing, to stop making these lemon bars because I end up devouring all of them squares. The first time CSC made them, I thought the curd on top didn't set right. It was too soft and it became mushy sitting out at room temperature. The too-soft curd did not stop me from eating almost all of the bars though. The crust was all right. The second time CSC made them, the curd set up beautifully and had proper, proper form. The crust was a little bit too hard, not as flaky as the first time she made them. Again, this didn't stop me from eating all of the lemon bar squares. When we were down to the last square, and I was savouring it after dinner, my nephew came up to me and asked if he could have the lemon bar. Normally, I would say yes, but this was. The. Last. 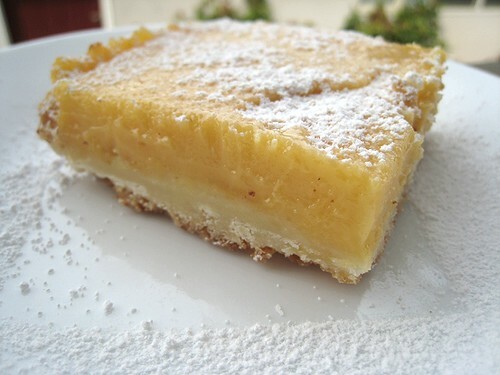 Lemon bar. I just smiled at him after his first request. Then he repeated it again and asked if he could have the last lemon bar. I said, "It's the last lemon bar though." He kept at it, hovering around me, and was trying to grab at my lemon bar, using his fingers to get at the lemon curd! I told my persistent nephew, "No, you can't have it, especially if you're just going to eat the top part. Because, what am I going to do with just the bottom?" I cut a piece of the. last. lemon. bar. and gave it to him. I told him, "You try this. You have to eat it with the crust." While he chewed, I told him, "See, it's so much better when you eat them both at the same time. There's the flaky crust and the soft lemon part together. It's more delicious that way." I ended up giving him about half of the. last. lemon. bar. while I gave my niece about a quarter. 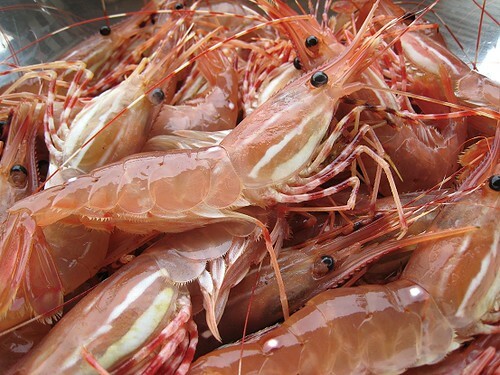 'Tis the season for spot prawns! 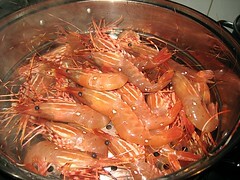 We got some spot prawns for the weekend and set about doing them on the grill. 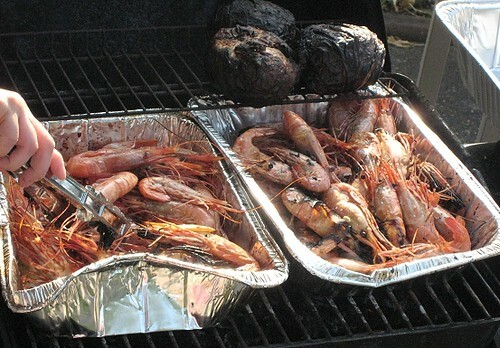 We usually steam prawns, but I figure we'd give the grill a try. Please bear with the pictures. They are quite awful. I really have no photography skills and I'm too lazy to bother to learn. 4:30 on a Sunday and we decided to invite our cousins over to Sunday dinner. We had a chicken waiting in the fridge, some spot prawns, and two fillets of steelhead trout. 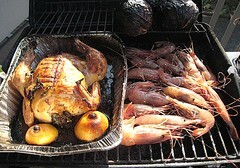 I figure we'd do something really simple, like roast the chicken, grill the prawns, and grill the trout. Since it was a warm day, I didn't want to heat up the house by turning the stove or the oven on. I thought I could do everything on the grill, provided I time everything right. The chicken was simply seasoned with salt and pepper, squirted with lemon juice, and stuffed with some thyme and oregano from the garden. I thought better of putting the chicken on the grill directly, so I used a disposable roasting pan and tried my best to cram everything inside our small grill. 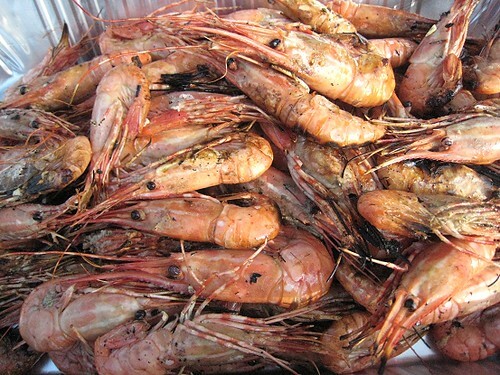 At first, I put the prawns directly on the grill. After putting about half of them on the grill, I started to question the wisdom of it. What would happen if there was a flare-up? I would have to pull those prawns out one by one. That didn't seem wise to me so I started putting the prawns in disposable roasting pans, with a little bit of olive oil, lemon juice, and salt and pepper. Those very dark balls were radicchio. 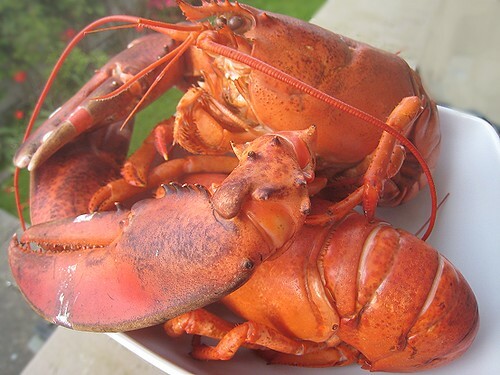 I just put them on the grill as well whole. I figured I was going to remove the outer leaves anyways. After they've cooked through, I turned down the flames and put them one by one on the grill so they'll just have a little bit of the char. 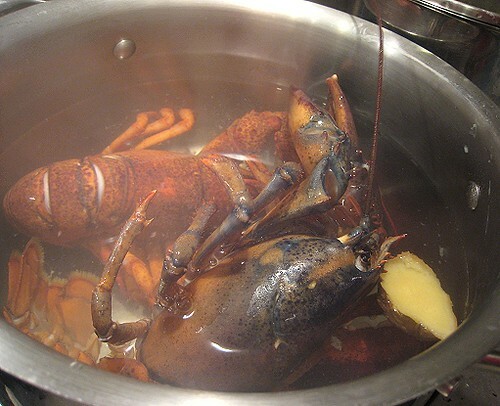 Because, you know, those charred shells just smell so awesome and they are delicious with the sweet flesh of the prawns. Next time, I'll probably get one of those grill baskets and see how well they work. I also want to get a bigger grill, by the way, because this one has become too small for our needs. 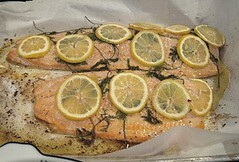 There was no time to put the trout on the grill so I just quickly roasted them in the oven with dill, lemon juice, olive oil, salt and pepper. The trout looks a little bit pale -- and pardon that I did not put it on a nice presentation platter, because that's more plates to wash -- but I must say it was perfectly cooked. 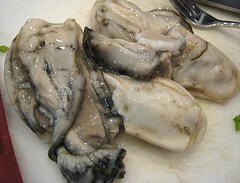 It was moist and juicy. I liked the acidity of the lemons with the fish. The chicken was just a smidgen overcooked (about 5 minutes past the optimal cook-time) but even the breast sections were still juicy. In our house, it's common practice to get the chicken a tad overcooked, since other family members are squeamish about seeing any red near the bones. I had a small portion of breast and the flavours were spot-on. 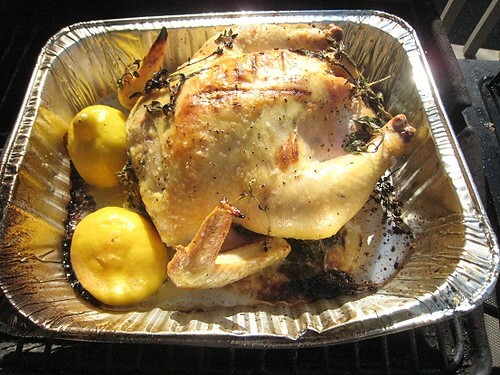 I really love roast chicken and simply done like this one is always my favourite. 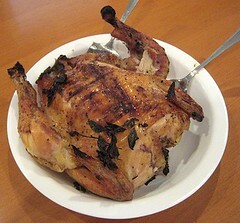 The chicken doesn't look too pretty, but I favour substance over style anytime. For the grilled prawns, I loved them! I love the smell, I love the flavours. In fact, grilling the prawns is now my favourite way to have them. There's just something about the flame that accentuates the sweetness of the prawns. 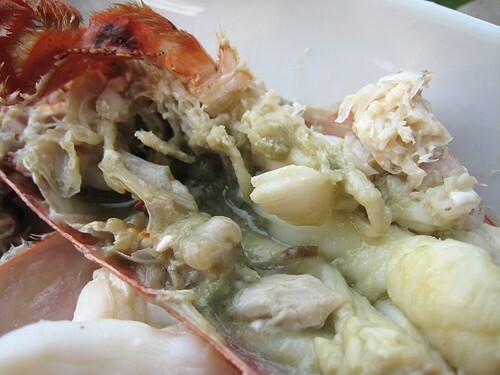 The flavours just seem more multi-dimensional to me, compared with simply steaming the prawns. 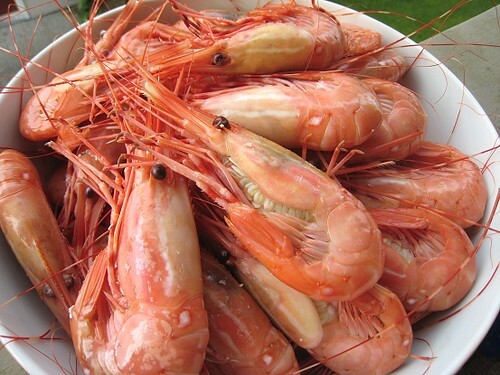 Several of our family members have also professed to liking the prawns better grilled instead of steamed, so next time we have a spot prawn feast, we'll be cooking them up both ways. 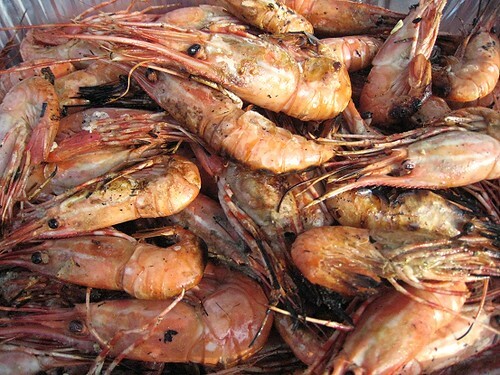 I'll be looking for more spot prawn goodness in the coming weeks. 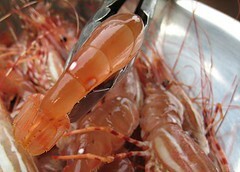 The season is almost over so better get the prawns while they're still here.